Articles > Q&a Keane - Tom Chaplin on the band's new Best Of... "It's a proper journey through the best things we've done"
Q&a Keane - Tom Chaplin on the band's new Best Of... "It's a proper journey through the best things we've done"
Keane are set to release their Best Of on 11 November - Q can exclusively announce (see below for the full tracklist). For a unique guide to the 20 song, career-spanning collection we spoke to frontman Tom Chaplin for this week's Q&a... Plus if you've got your own questions, drummer Richard Hughes will be taking over Q's Twitter account this evening (16 August) from 5pm (BST). Follow us @QMagazine, post your questions with the hashtag #QKeane and Richard will do his best to answer as many as possible once he takes control. How the devil are you? "I'm tired! Just got back to England from a late night show in Portugal - decided to take the early morning Ryanair option home. Enough said." How does it feel to have reached the Best Of/ Greatest hits stage of your career? Ever doubt you'd get here? "It's difficult to answer. When I was a kid I dreamed of being in a successful band - I even used to interview myself - I was fairly eccentric like that! However, there was a long period before Keane became a success and there were plenty of doubtful times. Even once we'd got out there and had success with Hopes & Fears, I still don't know how confident I was..."
How did you go about choosing what to include on the new collection, pure stats or was there a mixtape approach to the album? "We were going to make a record that consisted purely of singles. That idea got vetoed very early on in favour of making something that feels like a proper journey through the best things we've done. Very often singles are a bit of an arbitrary and commercial decision, so they don't necessarily reflect the full story. I think we feel our albums have real strength in depth, so it's nice to show off a wider range of songs. I hope that people who don't know the albums are inspired to go and listen to them when they hear this Best Of!" What absolutely had to be on there... "There's a song called My Shadow, which was on The Night Train EP, that we did. I felt that it never got full justice by being tucked away on that release - so it's great that it gets a second chance here. It's a song about companionship, about looking out for people. I love singing that one live - I have a sense of some kind of cosmic connectedness with the crowd when we play it. If that sounds wanly, then listen to the song - then it'll make sense! I'm also pretty pleased that there's a whole collection of the B-sides in one place for the first time. We spent a lot of time working on them over the years and I feel they make a special album in their own right!" ...and personally, what are you gutted you didn't quite have room for? "I'm happy with the way it is... there wasn't really any conflict or animosity over choosing the list. With all the B-sides chucked in there, it's hard to think of anything that's really missing!" Thinking back to when you first started out and the expectations you had, how has it compared to what happened? "Expectations are so abstract compared to what happens in reality. I'm sure I've ended-up with more than I could ever have wanted and dreamed of. 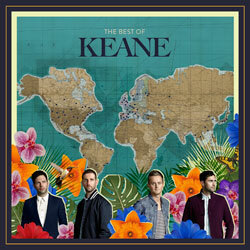 Mostly I feel very happy and content with what Keane has given me and proud of the things I've achieved. However, the reality is much less black and white than that. When you dream of how it's going to be, it's endless hits, glamorous parties and jetting off into the sunset after playing to stadiums of adoring fans. There's a morsel of that that comes true, but it's not how you imagined it would be when you gazed at those pictures of The Beatles as a kid." For more, including details of the B-side release, head to Keanemusic.com, plus don't forget to join Richard live from 5pm tonight @QMagazine.